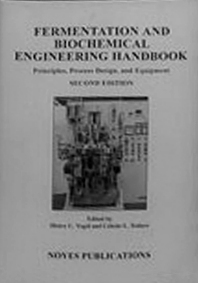 This is a well-rounded handbook of fermentation and biochemical engineering presenting techniques for the commercial production of chemicals and pharmaceuticals via fermentation. Emphasis is given to unit operations fermentation, separation, purification, and recovery. Principles, process design, and equipment are detailed. Environment aspects are covered. The practical aspects of development, design, and operation are stressed. Theory is included to provide the necessary insight for a particular operation. Problems addressed are the collection of pilot data, choice of scale-up parameters, selection of the right piece of equipment, pinpointing of likely trouble spots, and methods of troubleshooting. The text, written from a practical and operating viewpoint, will assist development, design, engineering and production personnel in the fermentation industry. Contributors were selected based on their industrial background and orientation. The book is illustrated with numerous figures, photographs and schematic diagrams.